Hi Lauren! 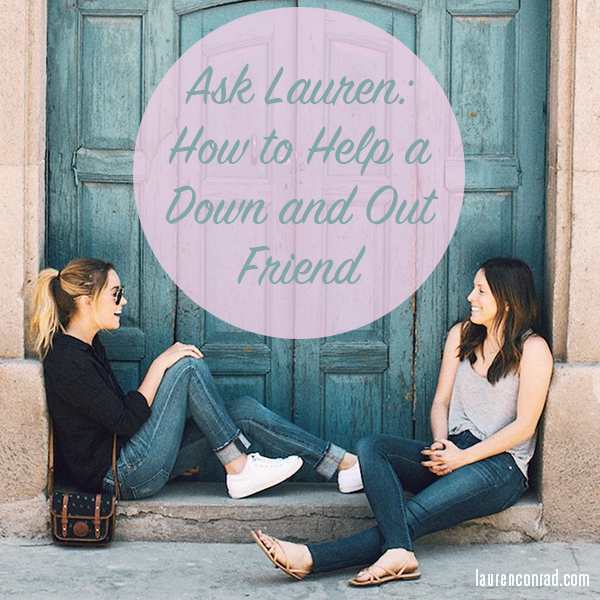 You are always good at giving advice, so I wanted to send you this Ask Lauren question. Maybe you will answer it on your website. I have a friend who is going through a hard time recently and I’m not sure how to help her. Her boyfriend broke up with her (she thought they were going to get married) and her mom is sick. She doesn’t really want to talk about it, but she has been staying home a lot and I’m worried about her. What would you do in that situation? First of all, I love that you even sent me this question because it shows just how much you care about your friend. Being a good friend is one of the qualities I value most in other people, and I always strive to be a good friend myself. We all go through ups and downs, but having friends by your side is what will get you through the tough times. You may not know exactly what your friend is going through, but you can still show your sympathy by saying, “I can only imagine what you’re going through. I know it must be very hard.” Don’t expect your friend to want to share all the details of their loved one’s condition, because it can be exhausting to repeat them to everyone. Instead, just focus on being a shoulder your friend can lean on. Instead of saying “Please let me know if I can help,” offer to help in very specific ways (ie. “Can I bring you dinner tonight?” or “Can I come over this evening and clean up your house for you?”) Resist the urge to tell your friend that everything is going to be OK, because you don’t always know that. Instead, tell them how sorry you are that they have to deal with this, and how much you love them. Getting laid off can make a person feel very vulnerable. Again, I recommend offering to help your friend in very specific ways like reading over their resume or reaching out to other friends for job leads. Also, be sensitive to the fact that they may be on a tighter budget while they are unemployed. Instead of inviting them out to an expensive dinner, suggest that you cook together at home or meet for coffee instead. Every situation is a little bit different depending on what the person is going through and how they deal with hardship. But in general, I always think that spending time with your friend and just being by their side is the most important. If your friend is not ready to talk about it yet, don’t force it. Just be there for her and let her know you are there to talk whenever she is ready. If she doesn’t feel like going out, bring over popcorn and a favorite funny movie. Being physically present for a friend will let them know that they are not going through it alone. Do you have any advice for this reader? Leave them in the comments. You can keep it anonymous if you like. Ask Lauren: Boyfriends Before Friends? Ask Lauren: My Friends are All Engaged! Ask Lauren: How Do I Meet Mr. Right?